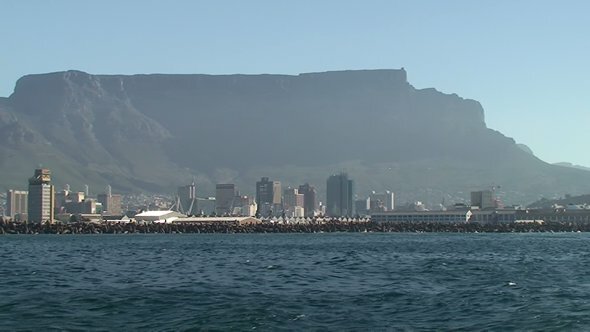 Cape Town is a lovely city to approach by sea, with the backdrop of dramatic mountains against a blue sky. We're now in the Royal Cape Yacht Club marina, with Table Mountain right in front of us. As I write, we're experiencing the influence of the Mountain! The wind forecast is for 18kts, but we're getting gusts down from the mountain of around 30kts, with the maximum so far 44.2Kts. The wind gets funnelled around the mountain and the marina is right in it's path. The marinas in South Africa tend to be operated by the yacht club they are part of. All the facilities - bars, restaurants, showers and toilets are all part of the yacht club and visitors such as ourselves take out temporary membership,(which is in addition to the marina fees). But it's not that expensive as the exchange rate is still good, so a night in the marina cost about £12. The reason for coming round is to get hauled out on the slip here to antifoul, check and grease the feathering propeller and rudder bearing, and change all the anodes. The plan is also to have the rigging replaced (apart from the 4 shrouds we replaced in Mauritius). Saturday turned out to be a day off. 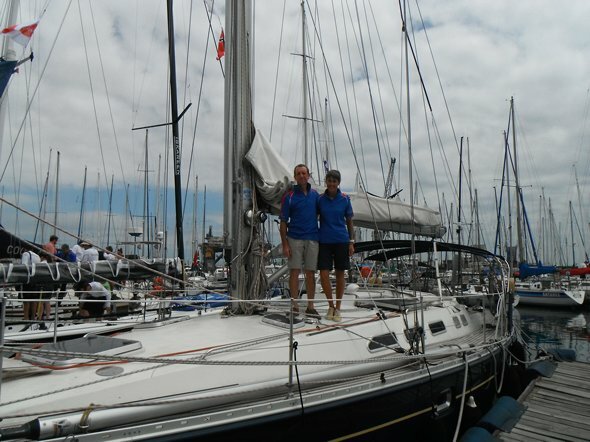 It was the start of the Cape2Rio race - Cape Town to Rio De Janeiro (South America). Jacaranda, the boat we came most of the way across the Indian Ocean with, is taking part, so as we were here and the boats all left from the marina, we said our good-byes and saw them off, along with the other 35 competitors. 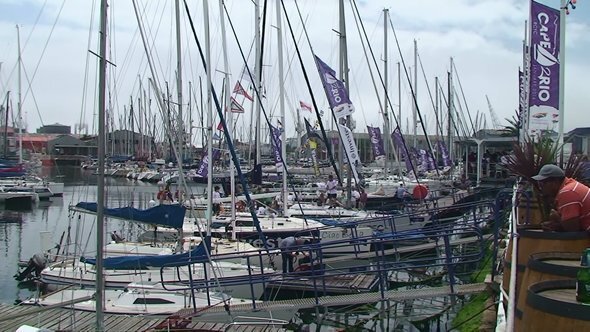 They left the marina at 12.00 and it gave us time to head down to the city's Waterfront development to watch the start at 14.00 and see the yachts as they went round the buoys to let the locals get a good look before they headed out for their first night at sea. And what a first night it turned out to be. A small, but vicious low pressure system with 50+kt winds and 6 metre seas developed and hit the fleet. Some decided to go through it to get to favourable winds the other side, others went north to try and avoid the worst of it. By the end of the second day,10 boats had retired with problems and some injuries, including one fatality due to a mast coming down. The rescue services and the SA Navy were mobilised and have been towing or escorting boats back to Cape Town. Having a low pressure system hugging the coast and go north is unusual for this time of year. (It looked like a compact tropical storm on the satellite picture.) The passage from here north is supposed to be one with great sailing conditions. Once you're clear of the coast by about 250 miles it should be tradewinds all the way! The high winds are now hitting Cape Town, but the 26 boats still in the race are now experiencing much better conditions and are well on their way, including Jacaranda who hove to and let the storm pass ahead before continuing. We have been speaking to them each morning on the SSB and they're fine. We've also spoken with another boat not in the race who we know going the same direction and they are okay too, but well shaken up having had dreadful conditions - 52 hours with winds staying between 32 and 55kts, with breaking 5 to 6 metre seas. But they're through it now and making good speed towards St Helena in good conditions. 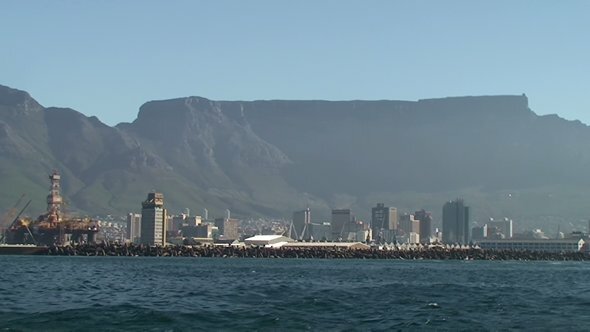 The main city area of Cape Town. coming into the marina you have to head in between the arrival/departure of big ships. city. 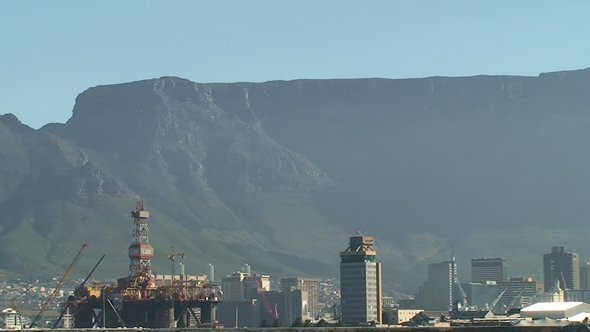 The whole lot though is dwarfed by Table Mountain. Flags flying in the marina for the start of the Cape2Rio race.